Navigate to the Integrations page of your project and select the Kubernetes service to configure it. Fill in all the needed parameters, check the "Active" checkbox and hit Save changes for the changes to take effect. API URL - It's the URL that GitLab uses to access the Kubernetes API. 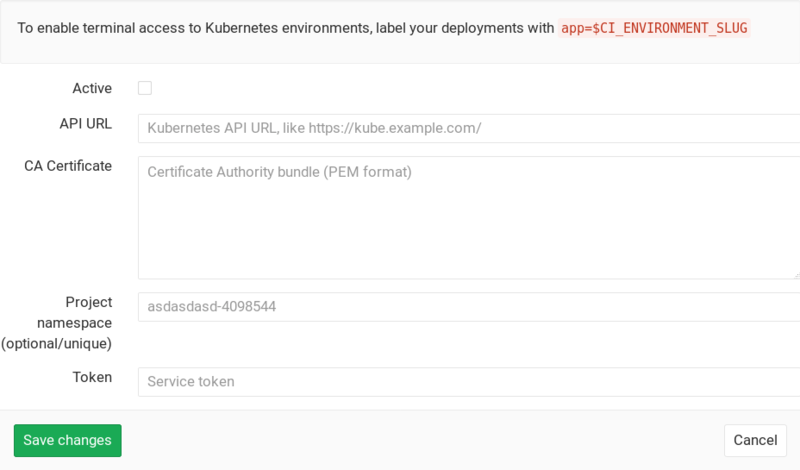 Kubernetes exposes several APIs, we want the "base" URL that is common to all of them, e.g., https://kubernetes.example.com rather than https://kubernetes.example.com/api/v1. CA certificate (optional) - If the API is using a self-signed TLS certificate, you'll also need to include the ca.crt contents here. By default you don't have to fill it in; by leaving it blank, GitLab will create one for you. Token - GitLab authenticates against Kubernetes using service tokens, which are scoped to a particular namespace. If you don't have a service token yet, you can follow the Kubernetes documentation to create one. You can also view or create service tokens in the Kubernetes dashboard (under Config > Secrets). TIP: Tip: If you have a single cluster that you want to use for all your projects, you can pre-fill the settings page with a default template. To configure the template, see Services Templates. KUBE_URL - Equal to the API URL. KUBE_TOKEN - The Kubernetes token. KUBE_NAMESPACE - The Kubernetes namespace is auto-generated if not specified. The default value is <project_name>-<project_id>. You can overwrite it to use different one if needed, otherwise the KUBE_NAMESPACE variable will receive the default value. KUBE_CA_PEM_FILE - Only present if a custom CA bundle was specified. Path to a file containing PEM data. KUBE_CA_PEM (deprecated) - Only if a custom CA bundle was specified. Raw PEM data. KUBECONFIG - Path to a file containing kubeconfig for this deployment. CA bundle would be embedded if specified. Available in GitLab Enterprise Edition Premium. NOTE: Note: Introduced in GitLab 8.15. You must be the project owner or have master permissions to use terminals. Support is limited to the first container in the first pod of your environment.